This is warm hearted, well acted and nicely shot and the dog is undeniably cute but the story is ultimately too slight to sustain a 90 minute film. Directed by Lasse Hallstrom, Hachi: A Dog's Tale is a remake of a 1987 Japanese film that was in turn inspired by the true story of an Akita dog in Japanese folklore, whose undying loyalty inspired the statue outside Shibuya station. 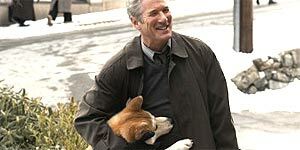 Richard Gere plays Rhode Island university professor Parker, who finds a lost Akita puppy at a train station and takes it home, much to the annoyance of his wife, Cate (Joan Allen), who had banned him from having another dog. However, Parker and the dog (who he names Hachi after the Japanese symbol found on his collar) develop such a remarkable bond that Cate is forced to relent and Hachi becomes a devoted member of the family. Every morning, Hachi accompanies Parker to the train station and waits patiently for his return, becoming a regular fixture in the community as a result. Gere is excellent as Parker, delivering a likeable, warm-hearted performance that is extremely charming. He also creates an onscreen bond with Hachi (played, as usual, by several different dogs) that will melt even the most cynical of hearts. The dog itself is impossibly cute, especially during the puppy years – if you see the film at the cinema, be prepared to be surrounded by entire roomfuls of people going “Awwww” involuntarily. It's also beautifully shot throughout and there's strong support from Allen, Sarah Roemer (as Parker's grown-up daughter), Jason Alexander (as station master Carl) and Cary-Hiroyuki Tagawa as Parker's friend Ken. The problem is that the story, whilst undeniably moving, is ultimately too slight to sustain a 90 minute running time – once Hachi starts waiting at the station, that's basically all that happens for the next 40 minutes or so. Much of the blame for this rests with the script, which could easily have made engaging sub-plots out of each of the station-based supporting characters (particularly Erick Avari and Davenia McFadden as a hot dog vendor and a bookseller) but leaves them frustratingly underwritten and essentially repeating the same dialogue over and over again. That said, Hachi: A Dog’s Tale is never less than watchable and the story is genuinely moving, thanks to a charming performance from Richard Gere.